I get this question all of the time, and it is a question that I revel in, because I know the answer. Isn’t that a lovely thing? Questions that we know the answer to? When people ask me this, I smile and sink in, and then embark on a long winded attempt to explain some number of inanimate things and very animate ideas that, when combined, give me the butterflies. Just like a teenager. There is only one person on this earth that makes me feel like that. When he is not around, it is the photograph that makes my heart race. So, I thought today was an appropriate time, with the help of some new work, to try and find the words to explain why. 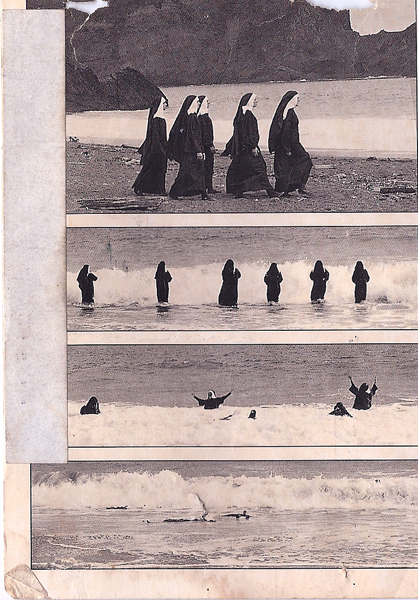 The first photograph that really stood out to me was an old post card with a group of nuns walking into the ocean, and then gleefully playing in the surf. It’s an old looking image, shot on film, and grainy; just like a dream. The post card was a gift from one of my oldest friends, and in my memory she gave it to me when we were barely reaching for the gas pedals in our first cars. Looking at it now, the evidence that proves me wrong is literally printed on the back. 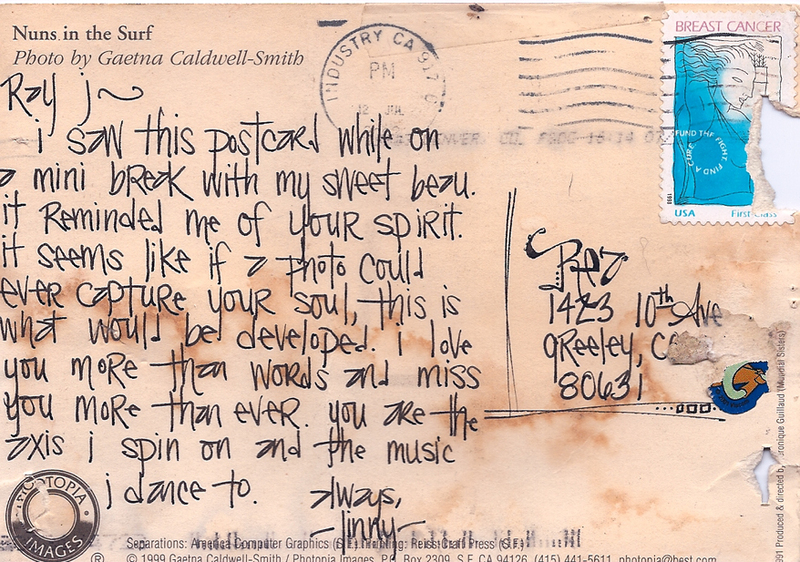 It was mailed during my last year in college, just before I took off to New York for a few years. Perhaps that explains the feeling of childish wonderment that I had when first I saw it? The image itself moved me. I mean, of course it did. But what I found printed on the back took it that much further. My sweet friend told me, in her own unique scrawl, that the image reminded her of me, of my soul, and there was no containing my joy. Like those nuns, I was free. Swimming around in that moment. There is something to be said for the perspective of another person. That image took on a whole new power when paired with her words. And I made a choice right then, with out even knowing it. I realized that images use all kinds of elements to tell the story of what is unfolding. The photographer may use color and light, or the position and weight of the composition to make their expression. In that same respect, the pairing of deliberately chosen words, can better express the way that the scene makes us feel. For me, as the photographer, this dance continues when I consider the viewer, and their personal input. Their involvement can change everything. In all this control, and then giving over of control, I had found the power to change things that I did not like, or make them better. All I had to do was acknowledge the power of my own perspective. My desire to share all of this began to unfold on the 21st, when I hit the publish button on my last post. I immediately had a hangover from my over indulgent opinions about a one, Mr. John Mayer. Why did I care what some pampered rock star was saying in his five minutes? I sat on that thought for days, (too many days…) dipping my toes in the pools of first shame, then bitterness (each time ‘Waiting on the world to change’ would come on the radio), and finally release. I realized that it was his lack of forethought that had upset me. So few of us are really being heard, and the ones that get their chance, usually waste it talking about their conquests; sometimes conquests achieved all. by. themselves. About a year ago, I discovered two wonderful new things. An old train yard that you would think was abandoned, but is actually a hidden playground for train enthusiasts in the Boulder area. A small group of men take in old cars and over time bring them back to life. They do not seem to have any other end goal, but to tinker away at these colorful pieces of history. “It is purely for the enjoyment.” they told me. The second discovery, right around the same time, was a lovely young woman named Jana. Through a mutual friend, we made a connection and immediately supported each other by way of soul baring conversation and a love of music. She agreed to let me photograph her only a few weeks after we had met, and so it seemed a twist of fate that she should agree, on the anniversary of my two great discoveries, to model for me once again. These are the things that I want to put out into the world. Beautiful images that evoke emotion, and stories that provoke thought. I may never get my five minutes, and that wouldn’t be so bad. But for those of you that are looking……Thanks & stay tuned. < Previous John Mayer killed Santa Clause….